In among the hipster hang-outs and trendy taverns of Portland’s happening Hawthorne district, you’ll find Lardo. With a pig as it’s logo and a name that sounds like what you’re bound to look like after consumption – Lardo is a must visit for all (not you vegetarians). Whilst Lardo would call itself a sandwich shop, we tend to avoid such an ambiguous definition and just swing straight for ‘great place for burgers’. The Joint: Lardo, 1212 SE Hawthorne Blvd, Portland, Oregon, USA. Check out their website here. The Vibe: Lardo began life serving street-food from a van, as much of Portland’s cuisine tends to. 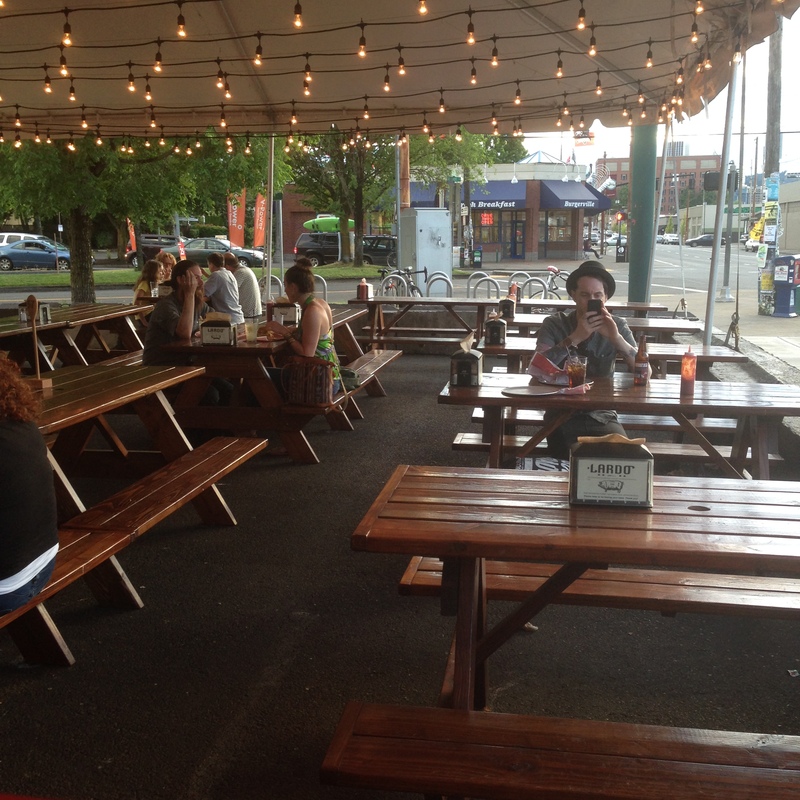 However, after proving highly successful with the locals, Lardo managed to set-up shop in the hipster centric Hawthorne. 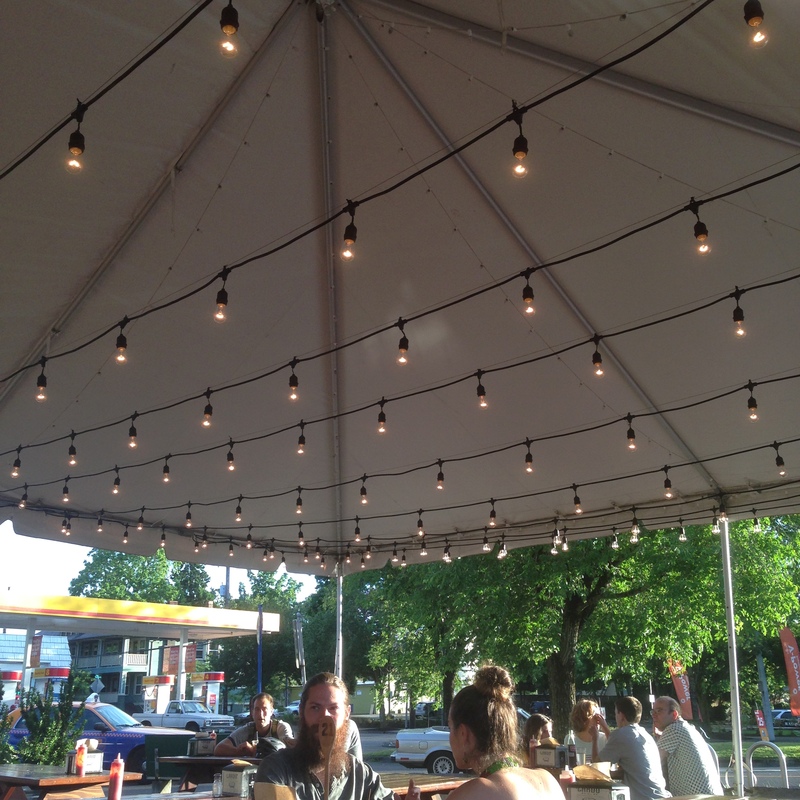 The restaurant still retains the look and feel of its pop-up days, with an outside area lit by fairy lights that gives the impression you’re just perching, rather than dining. The outside vibe is joined by burgers served in paper, take-away style which all adds to the rustic feel; everyone enjoys eating al-fresco in the summer, right? We opted for the classic. In the hunt for the world’s greatest burger, you have to keep some constants to ensure a fair experiment. So, without much fuss or decision making needed, we ordered the ‘Double burger’. This consisted of; cascade natural beef, pork-strami (a pork based pastrami), cheddar, lettuce and that extra special Lardo sauce. The cherry on top,was the chunky gerkin stuck, quite literally, on top of the burger. It added a certain aesthetic that you don’t get from all burgers. They tend to have that one homogenous look so this was a nice touch. Washed down with some fresh chips (that’s crisps to us Brits), and a good glug of their craft beer on top – Lardo proved to be the perfect start to our leisurely evening in PDX. As veteran burger biters, we’ve eaten a lot of these beefy buns. This was not the best burger in the world, as far as that is concerned, the search continues… However, it was absolutely the best burger in Portland, by a country mile and if you’re ever on the West Coast and don’t pop to Lardo, you will be missing out. Lardo was visited by Leah in June 2014. HAVE YOU EATEN AT LARDO in portland? IF SO TELL US HOW YOU GOT ON OVER AT OUR TWITTER PROFILE – @OUTFORLUNCHBLOG. 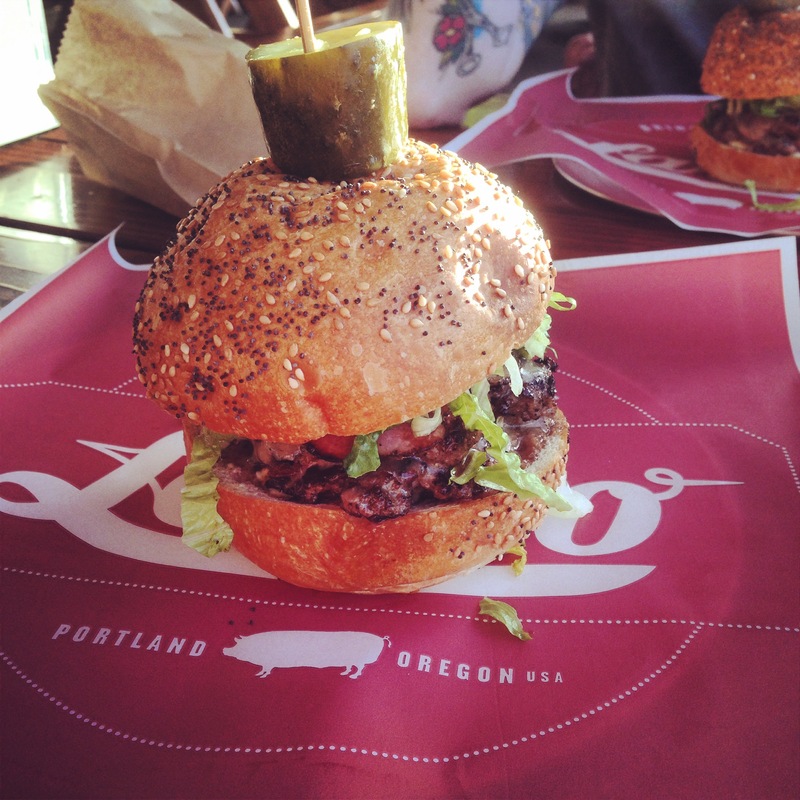 Posted in PortlandTagged alfresco, beef, burger, Burgers, cascade, craft beer, double burger, Hawthorne, hipster, lardo, lunch, oregon, PDX, pig, porkstrami, portland, usa, west coastBookmark the permalink.